An ETF, or exchange traded fund, is an investment fund or portfolio of securities that holds assets like stocks, bonds or commodities. Most ETFs track market indexes, from the very broad to the very narrow. ETFs aren't purchased or sold once a day like a mutual fund, but instead trade like stocks on an exchange and experience price changes throughout the day as shares are bought and sold from one investor to another. Now trade over 500 commission-free ETFs online through Schwab ETF OneSource™. Broaden your exposure with 500+ ETFs across asset classes and fund companies, available commission-free online through Schwab ETF OneSource™. Schwab ETFs™ include both market cap index ETFs and Fundamental Index® ETFs, two different ETF methodologies that can work well together. For broader diversification, consider using both when building your portfolio. Consider professional management of your ETF investments. Automated investing with human help when you need it. Our robo-advisor builds, monitors, and automatically rebalances a diversified portfolio based on your goals. Plus, add our premium service for planning and unlimited 1:1 guidance from a CERTIFIED FINANCIAL PLANNER™ professional. Get professionally managed portfolio of ETFs at a competitive price, with ongoing advice from a Schwab investment professional. $25,000 minimum. Learn more about our professionally managed ETF strategies, composed primarily of ETFs that seeks to capture much of the growth in rising markets while attempting to reduce exposure in declining ones. $100,000 minimum for brokerage/IRA accounts. Learn more about ETFs by using our learning center and our comprehensive research tools and reports. Find and compare up to three ETFs at once using our extensive ETF research and helpful screeners to compare cost, quality, holdings and performance. Use our Personalized Portfolio Builder to create a diversified portfolio based on your investment preference, mutual funds or ETFs, risk profile, and initial investment. View charts to see the fund’s benchmark performance, fund strategy details, and Morningstar style and ratings. Want to learn more about choosing an ETF? 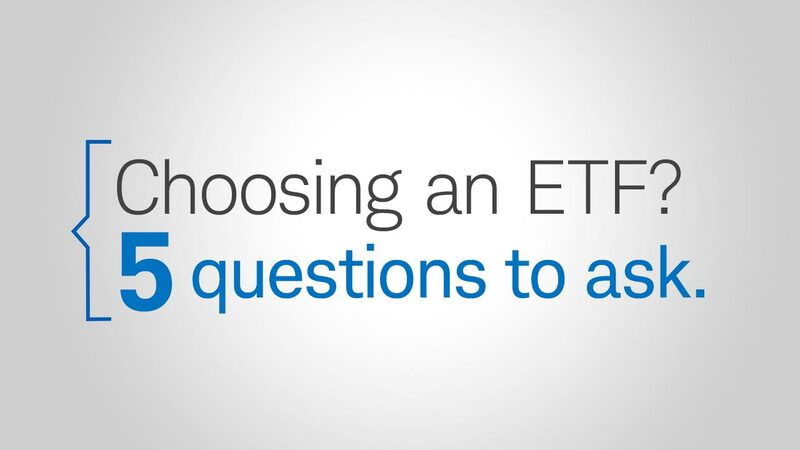 Watch the video or read below for answers to the top five questions you should ask before investing in ETFs. So you're thinking about investing in an exchanged-traded fund. You've decided on the asset class you want to invest in, and you found a few ETFs that could be right for your portfolio, but how do you know which of those ETFs is the right ETF for you? Start by asking yourself these five important questions about any ETF you're considering. Let's take them one-by-one. First, what's the expense ratio? When you're choosing an ETF cost is an important factor. The expense ratio is the percentage of fund assets that are deducted every year to cover management fees. Check to make sure that your ETF has an expense ratio that's low compared to other funds in the same category. Question 2: What will you pay in trade commission? Trade commission is the second part of the cost equation. It's the fee you pay every time you buy or sell an ETF. Look for a low commission or no commission at all, if possible. Question 3: What's the bid/ask spread? The bid/ask spread is another cost. This is the difference between the ETF's bid price, which is the price a buyer is willing to pay for a share, and its ask price, which is the price a seller is willing to accept for a share. Often, the more an ETF is traded, the smaller the bid/ask spread, and the smaller the bid/ask spread, the more of your money goes to the actual investment, which is better for you. Look for a spread of just a few pennies. Question 4: What are the fund's total assets under management? You've considered the cost of your ETF. Now, look at the quality. Assets under management refers to the amount of money that's already been invested in the ETF. It's a pretty good indicator of the fund's viability. Schwab's experts prefer ETFs that have at least $20 million in assets, and, preferably, much more. In general, the more assets under management, the better. Question 5: How do the ETF's returns compare to its benchmarks' returns? What you want to see is the ETFs performance tracking closely to the performance of its benchmark over time. If there are significant differences between the two sets of returns, it could mean that you're looking at a potentially riskier investment. So those are our five questions. Let's see how asking them can help you decide between two similar ETFs from the same asset class. We'll take two hypothetical ETFs and ask what's the expense ratio, the trade commission, the bid/ask spread, what are the assets under management, and how well do its returns track to the benchmark? While this is a simple example, working through these five questions really can help you see which ETF might be a better pick. Ready to find the ETF that's right for your portfolio? Schwab's ETF evaluation tools are a great place to start. You'll find them at Schwab.com/ETFTools. And if you need help as you choose the right ETF for you, just call us at 877-769-8003. Open an account at Schwab today to start saving on ETFs. Open an Account Call 866-855-7728. Visit a branch. 1. Conditions Apply: Trades in ETFs available through Schwab ETF OneSource™ (including Schwab ETFs™) are available without commissions when placed online in a Schwab account. Service charges apply for trade orders placed through a broker ($25) or by automated phone ($5). An exchange processing fee applies to sell transactions. Certain types of Schwab ETF OneSource transactions are not eligible for the commission waiver, such as short sells and buys to cover (not including Schwab ETFs). Schwab reserves the right to change the ETFs we make available without commissions. All ETFs are subject to management fees and expenses. Please see Charles Schwab Pricing Guide for additional information. Charles Schwab & Co., Inc. receives remuneration from certain third‐party ETF companies participating in Schwab ETF OneSource™ for record keeping, shareholder services, and other administrative services, including program development and maintenance. Participating firms also may make additional payments for other ETF-related opportunities, such as education and events, and reporting. Schwab is a registered trademark of Charles Schwab & Co., Inc. Fundamental Index is a registered trademark of Research Affiliates, LLC. Schwab Intelligent Portfolios® and Schwab Intelligent Portfolios Premium™ are made available through Charles Schwab & Co., Inc. ("Schwab"), a dually registered investment adviser and broker-dealer. Portfolio management services are provided by Charles Schwab Investment Advisory, Inc. ("CSIA"). Schwab and CSIA are subsidiaries of The Charles Schwab Corporation. Portfolio Management for the Schwab Managed Portfolios is provided by Charles Schwab Investment Advisory, Inc. ("CSIA"), a registered investment adviser and an affiliate of Charles Schwab & Co., Inc. ("Schwab"). Both CSIA and Schwab are separate entities and subsidiaries of The Charles Schwab Corporation.